- The elbow, with support bracket. It has an upper pin fixed with a side screw for adjusting. At the base it has two screws for attaching the unique Vocalion automatic brake plate and lever. My bracket is broken, but repaired successfully with super glue. - The middle section, which is a straight tube with a downwards curve towards the soundbox end. The back part is a spheroid that engages in the elbow section thru a long pin with screw and nut. The front end has two deep grooves for engaging the next section in two possible positions. This front end has broken in several pieces. I can fix it, but it is very delicate. - The end section is a short double-elbow tube. At the back it has a spring loaded ball and set screw device for engaging into the tonearm in two different positions that allow the use for lateral/vertical records. The soundbox enters in the last curved tube by means of another spring loaded ball and set screw, which allows revolving the soundbox upwards for changing needles. I’m in bad need of a new elbow bracket and middle section in good shape. Gilded is preferable, but any other version would serve. Also if there is another version in steel or more solid metal, I’d be interested in that too... provided it retains the revolver feature that allows use with both types or records, and if the length is the same. This gramophone was purchased twenty years ago. It was the gramophone in the salon of a grand hotel built in the twenties, which was later closed in 1936. The hotel stayed closed since then, until a major reopening and overhaul was planned. The remaining of the furnishings were sold, but the grand daughter of the proprietors was given some things, this machine among them. It has gilded hardware, except the winding handle, and the sound system has the Graduola device for sound volume regulation. All except the mazak tonearm is in great shape. The wooden cabinet was entirely dismantled, thoroughly cleaned and rewaxed. The top of the lid suffered from humidity, and is deformed, but it was fixed and is safe. Its damage adds to the time patina, and as it is, is a real beauty. Illumination from the photos don't do justice to its impressive aspect. The lid stay was also broken, but I've got a replacement, not yet installed. 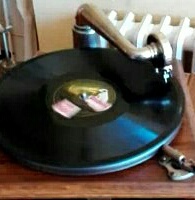 File comment: Tonearm. Middle section, damaged at the narrow end. File comment: Another view of the middle section. File comment: The beauty, lid opened. File comment: The beauty. Lid closed.